Dimensioni di questa anteprima: 794 × 600 pixel. Altre risoluzioni: 318 × 240 pixel | 636 × 480 pixel | 1 017 × 768 pixel | 1 280 × 967 pixel | 1 868 × 1 411 pixel. 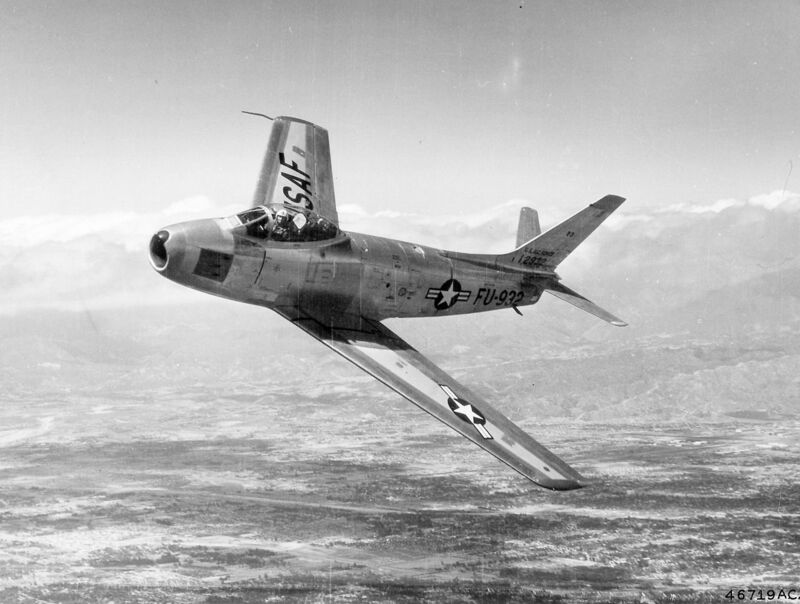 North American F-86F Sabre jet, 1953. The F-86F-35-NA had the capability of carrying a nuclear weapon. The 1200-pound Mk 12 "special store" (as the atomic bomb was euphemistically called) with a yield of up to 12 kT was carried under the port wing, while droptanks were attached under the starboard wing. The nuclear bomb was delivered by use of the Low Altitude Bombing System (LABS), in which the pilot approached the target at low altitude, pulled up to begin a loop, released the bomb near the top of the loop to throw the bomb away from the flight path, and then escaped the blast by climbing away with an Immelmann turn. The F-86F-35-NA was equipped with a computer for determining the exact instant of bomb release, along with a set of controls for arming and disarming the "special store" in flight. Conventional weapons that could be carried included a pair of 1000-pound or smaller bombs, two 750-pound napalm tanks, or eight 5-inch HVAR rockets. The F-35 was otherwise similar to other F-86Fs.